The Round Brilliant cut is the most popular of our cuts. They are hand cut when over the size of 5mm. 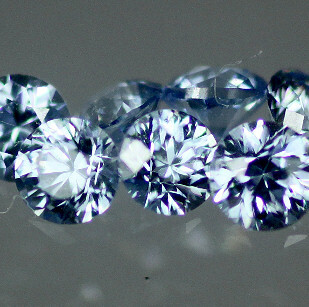 All the round brilliants have 57 facets even the tiny 1mm stones which are smaller than grains of sand. When a round brilliant cut is perfectly cut, it displays a hearts and arrows pattern under a scope called an ideal scope. There is a machine that can cut brilliant cut cz's perfectly every time. If you would like a perfectly cut round brilliant, then see the hearts and arrows cuts. If you have photos or videos of this stone, or artwork or jewellery you have made using this stone, you can upload them below. The link includes the option to advertise your website if you have a website that sells jewellery with our stones in it. Small amounts of gems that can be easily told apart will be packaged together. If you would like them packed separately and labelled click here.